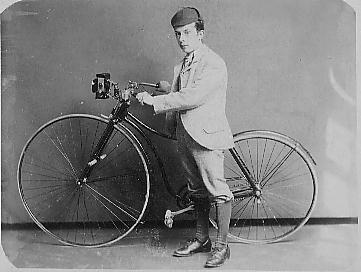 Alfred DOXEY aged 24 (brother of Walter) with his bicycle. Wheels are different sizes, front wheel steps, fixed wheel, front rod brake on tyre, mudguards, chainguard, hard tyres, acetylene front lamp. Alfred was the author's grandfather.